As its the New Year I am going to try and actually stick to New Years Resolutions ! Wiki defines it as: A commitment that a person makes to one or more personal goals, projects, or the reforming of a habit. A key element to a New Year’s resolution that sets it apart from other resolutions is that it is made in anticipation of the New Year and new beginnings. 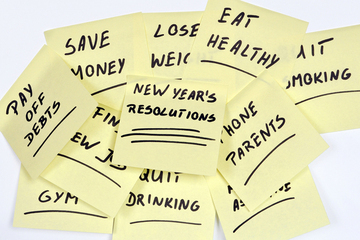 People committing themselves to a New Year’s resolution generally plan to do so for the whole following year. This lifestyle change is generally interpreted as advantageous. And I have the Classic Resolutions!! 1. Get in shape…..In reality no one can stick to a diet for 365 days a year! But if I eat healthy and exercise a few times a week I am hoping this will make a difference! Since I have started in the office it easy to eat the sticky goodies and eat lunch at my desk not this year! Unless its someones birthday…a small treat…failing already! 2. Eat Better……..This is kinda linked to the first one! But this year I can cut out the sugar, the fast foods and other unhealthy items! More Veggies! 3. Drink more Water…..I seriously do not drink enough H2O! The body’s natural cleanser. 4. Spend more time with Family……Well before I had the new job it was difficult to see them but now I have weekends I can spend more time with them. 5. Save Money……..yep save up for that rainy day! Lets see how long I keep these up! What are yours? Or do you have tips to help me achieve these?